This comes to inform you of Obinwanne Mbaitoli's Empowerment. It is going to a time of great empowerment that cuts across all strata. Market Women from Mbaitoli will be financially empowered for their petty business. Grinding Machines will be given out. Barbing Clippers will be given out to people that has learn how to Barb hair. Video Cameras to qualified photographers. Hair Dressers will be empowered. If you are a Brilliant Student from Mbaitoli LGA but no one to Support you rush now. 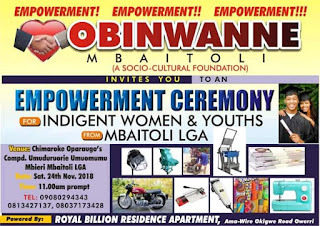 Venue: Chimaraoke Oparaugo's Compound UmuduruOrie Umuomumu Mbieri Mbaitoli LGA. This empowem is powered by Obinwanne Mbaitoli. Obinwanne Mbaitoli is a Socio-Cultural Organization founded by Comr. Chimaroke Oparaugo the CEO Royal Billion Hotel & Apartments . The Organization is non political. Completely dedicated to Empowerment of Women, men, Children and Youths. Comr. Chimaraoke Oparaugo has no Political interest as a very young outh from Umuduru Orie Umuomumu Mbieri but has helped so many people rise to a standard. According to him "One must not be a politician before you start helping the needy. We shall be doing that which we know how best to do come November.. and invites the people to be part of it"